Thanks to the automatic Smoking Bisquette system, you won't need to add wood chips manually during the cooking process. The smoker automatically detects when it's running low on chips and drops the correct amount inside. You can use only Bradley bisquettes. 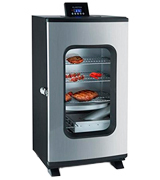 It's a premium-quality fully-automated smoker that can take the guesswork out of cooking process. It will help you produce the best tasting BBQ no matter whether you're a novice user or a seasoned BBQ master. It's also suitable for cold smoking. The unit comes almost fully assembled. All you need to do is attach top and door handles. All the hardware is included in the box. Also the package contains a handy tool for quick and safe rack removal. 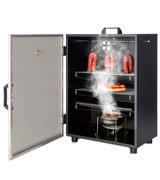 If you need a compact yet durable smoker for family use, choose this one from Klarstein, the well-known German company. 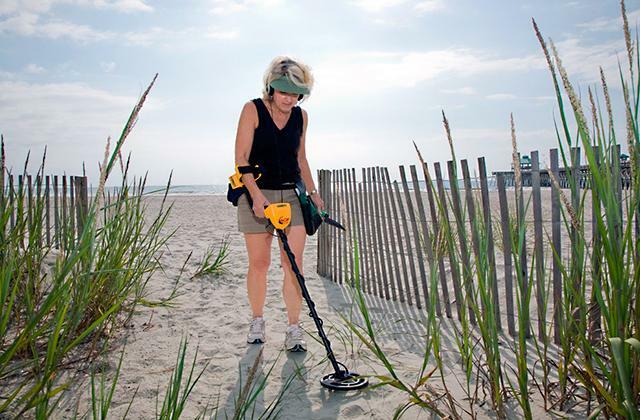 It's lightweight, portable, and easy to use. It has no frills and can let you discover the traditional art of smoking. This open-air smoker comes with no heating element. And although it's designed for hot smoking, you can purchase an additional cold smoking element and enjoy flavourous cheese or already-cooked fish. The edges of the unit are too sharp. The Smoker XL by Garden is a very reasonably-priced smoker that performs all the basic functions. With this product, you will be encouraged to cook more often and treat your close people to deliciously smoked food. 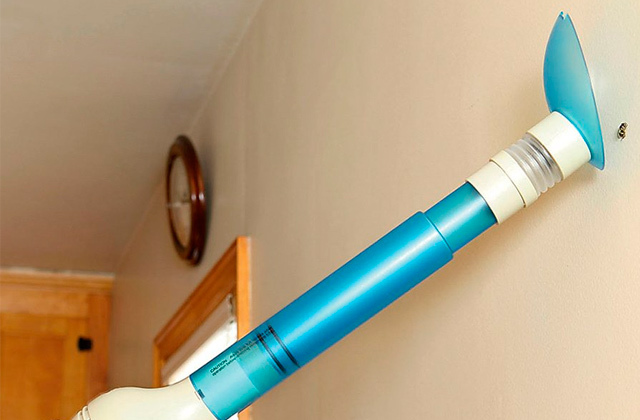 The chimney tube at the top of the unit allows you to precisely adjust the amount of smoke inside the chamber. Also, you can set the temperature and cooking time. All these features are especially useful for seasoned smokers. Some users note that the thermometer is a bit inaccurate. This smoker was carefully designed by Royal Catering to help aromatise various food to perfection. Packed with a 1000-Watt heating element and 70 litres of volume, it's undoubtedly one of the most powerful models out there. Thanks to the large viewing window, you can watch the smoking process without having to open the smokehouse. It's especially important if you want to smoke several ingredients at a time. To load large cuts of meat inside, you'll need to remove a few racks. The Klarstein GQM-1500-Fstone is a smokehouse made in Germany, which speaks a lot about its quality. It has a very long shelf life and generous interior capacity. It's perfect if you often host parties. The Bradley 4 Rack Digital is probably one of the most advanced smokers you can find on the market. It's a fully automated smoker, which you can ‘set and forget’, that will allow you to always get perfectly smoked meat, poultry, fish, and more. 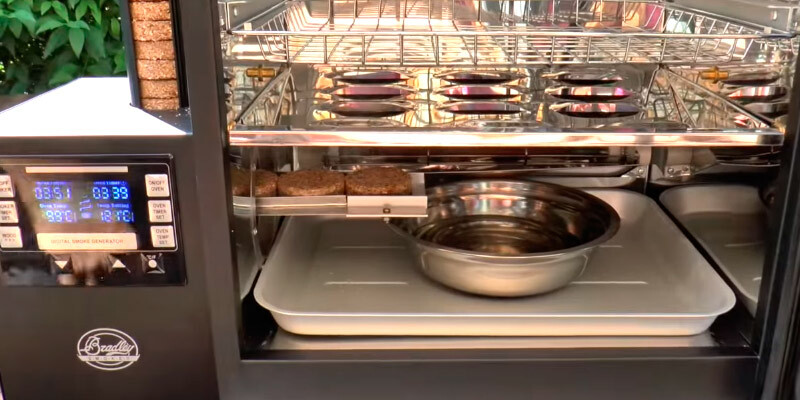 The ability to smoke food automatically is what sets this model apart from the competition. The trick is that it uses a digital controller that sets the smoking time and keeps the optimal temperature in the cooking chamber. Then it analyses this data and automatically adds new bisquettes when a time comes. 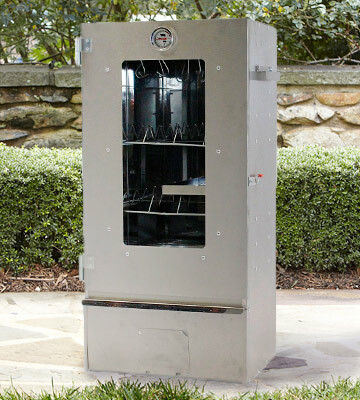 Of course, you'll need to pay a premium price for this digitally-controlled smoker, but we can assure you that it won't be a waste given all the top features the Bradley 4 Rack Digital smoker offers. As it's easy to decipher from the name, the smoker includes 4 racks that can accommodate quite a big amount of food. 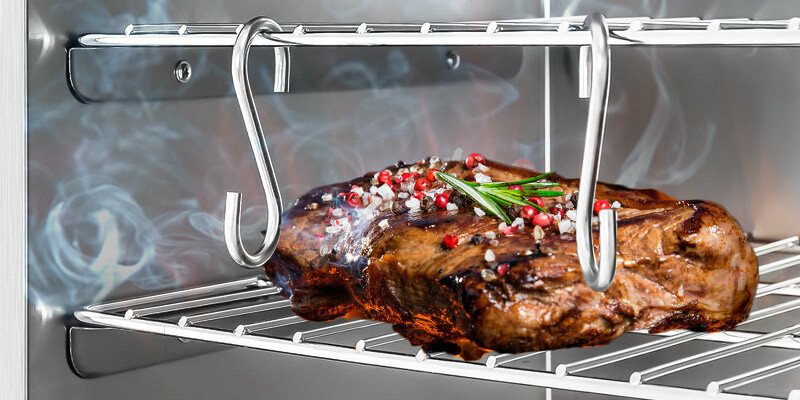 The racks can be rearranged so that you can smoke even larger food items. You will soon be able to fit just about anything inside its chamber. 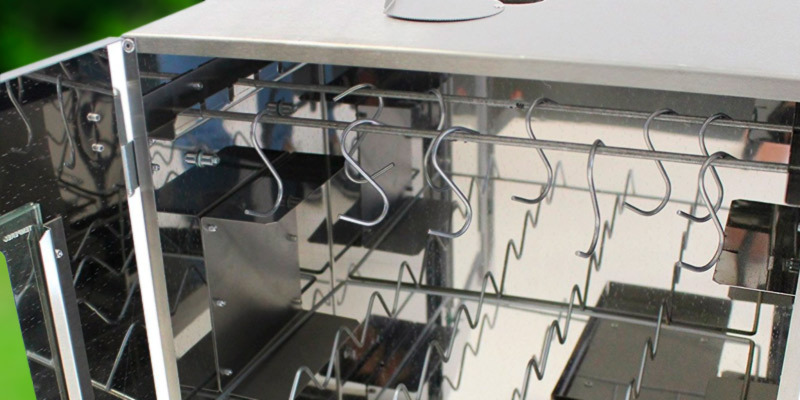 What we like the most, however, is that these racks, as well as the interior and exterior of the smoker, are made of high-quality stainless steel, which makes it extremely durable and easy to clean from sauce, smoke, and grease. The interior is well-insulated which allows it to maintain a stable temperature without drops and spikes no matter the weather. Besides high-quality insulation, the smoker boasts a great sealing system which allows it to prevent the smoke from escaping. But the advantages of the Bradley 4 Rack Digital smoking oven do not end here. In order to justify its rather dear price tag, the manufacturer built it so that it would be suitable both for hot and cold smoking. This way, you can add a smokey taste to any store-brought meat, be it poultry, pork, beef, or even fish, by smoking it in the Bradley 4 Rack Digital Smoker for about 8 hours. So while the unit is quite expensive (and we won't deny that), it's more than worth its lofty price tag given its functionality and the fact that it's able to produce some of best tasting BBQs. The smoker comes with an attached box that has a nice digital display panel and a holder for wood chips. The touchscreen digital panel is intuitive and easy to use. 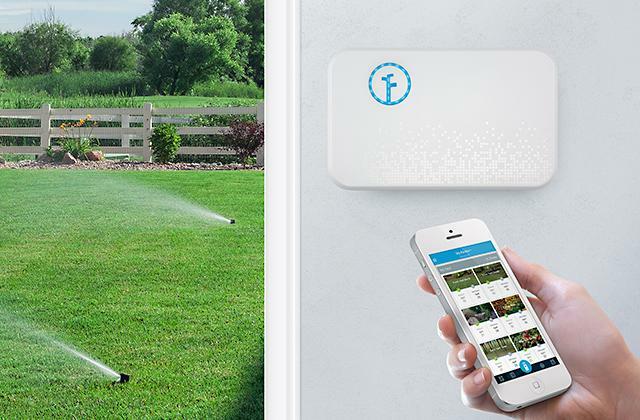 It features large buttons that let you turn the unit on/off and adjust the temperature. The information about the remaining cooking time and the inner temperature is displayed on this screen too, which is very convenient. The display is good size and clearly visible in both bright and low light conditions. 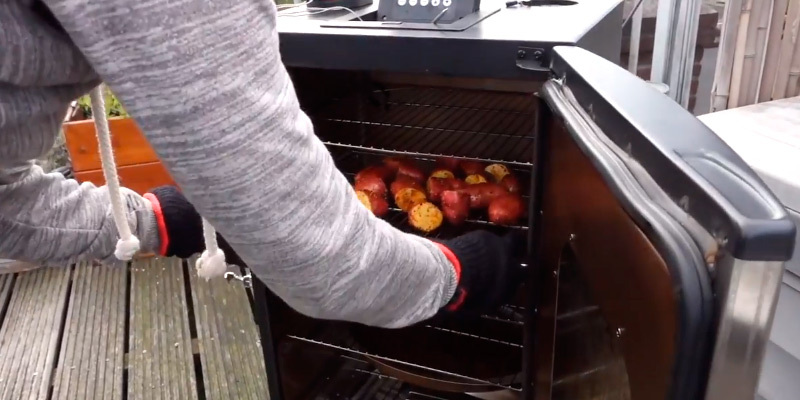 Thanks to special sensors, the smoker can automatically detect when it's running low on chips and "drop" the needed amount of wood inside to maintain the optimal heat and smoke. The feeder tube is large enough, so you can fill it right up and do not worry that bisquettes might run low in the middle of the cooking process. 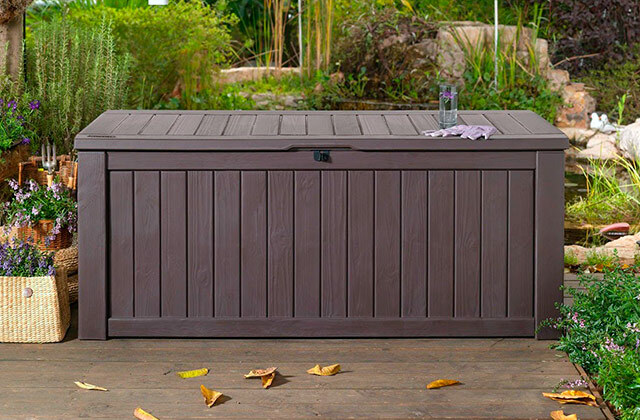 One thing that might be upsetting for some people is that this smoker can be used only with genuine Bradley bisquettes, which adds up extra maintenance costs. However, if these extra costs do not put you off and you're looking for the best the market can offer you, the Bradley BTD576CE should be right up your alley. When it comes to cooking appetizing smoked food for a whole family, the first smoker that comes to mind is the Klarstein Flintstone Steel Smoker Oven. 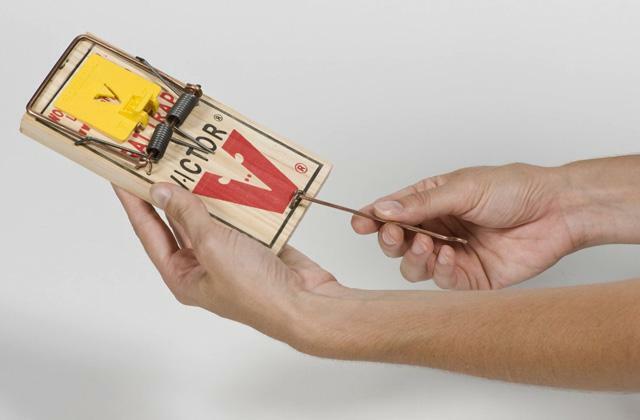 It's very compact, effective, and durable. It can smoke delicious meat, fish, sausage, veggies, tofu or/and anything else you want without any hazardous emissions. 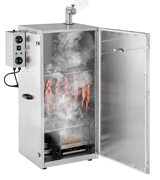 Equipped with an 800-Watt heating element this electric smoker is able to roast food ingredients to perfection while turning wood pieces to a cinder. Plus, the smoker allows for saturating food with various flavours; it can be safely used with all hardwood chips including aromatic. Everything about this smoker screams quality. 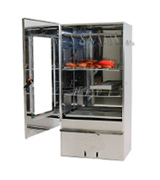 It's manufactured from thick stainless steel and has 3 chrome-finished smoker trays inside. Each one measures 40 x 25 cm and offers plenty of space for thick cuts of meat, poultry, hams, blocks of tofu, etc. 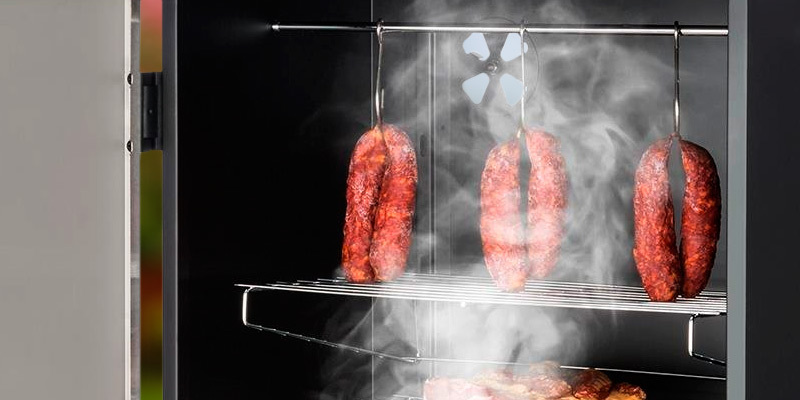 In addition to smoker trays, the oven has a drip tray to collect condensation and grease and three special hooks for smoking sausage creations. Perhaps, the only thing that some consumers might find a bit weird is that the smoking process is to be entirely controlled by a ventilation flap, rather than a display and control dials like in similar models, meaning you will only be able to change its smoking temperature by either closing or opening the flap. Other than that, there aren't many things inconvenient about this smoker. The model does a great job of smoking, is durable and can cook a whole load of food at once. So, if you're keen on the idea of treating your family to exquisite smoked delicacies now and then, the Klarstein Flintstone Steel Smoker Oven is a sound choice. Produced by one of the most trustworthy German companies, the Klarstein Flintstone Steel Smoker Oven is the type of smoker you will not be disappointed with. Put a drip tray on the bottom rack, above the chip bowl. That's it. The assembly is done. There's only one thing left to do. Before smoking any food, the manufacturer recommends running the oven for at least 20 minutes without chips so that the oven can "burn off" the residue that it might have absorbed during manufacturing. The "burn in" process must be done outdoors. If you are in need of a smoker that would be reasonably priced yet capable of performing all basic functions, the Smoker XL by Garden Plaza might be the right one for you. It costs almost twice less than other big brands yet performs its main task flawlessly. So while it doesn't have any bells and whistles, like Bluetooth connectivity, digital control panels, automatic wood feeder, etc, it is a solid fit if you're looking for your first smoker and not completely sure whether you'll use it frequently or not. As in most basic models, a vent here is placed at the bottom of the unit, which makes it easy to adjust the smoke thickness. Like you've probably guessed, there's neither display nor controls on the housing; what you'll find instead is a thermometer and a large viewing window that will let you check out what's happening inside the chamber and when it's time to add more chips. 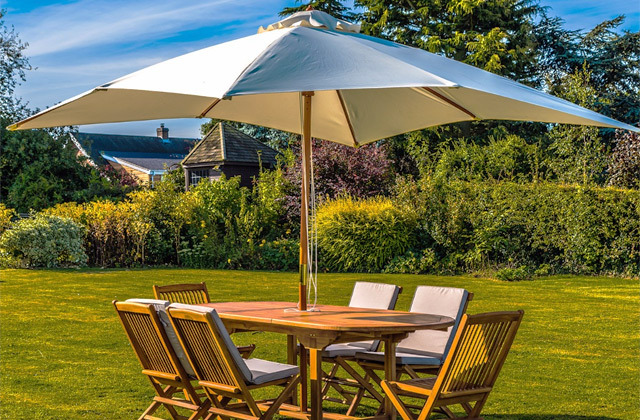 Although the Smoker XL by Garden Plaza is made of galvanized aluminium rather than stainless steel like the majority of models, it is high quality and robust. More importantly, it's able to hold heat longer and better. Speaking of the interior, the smoker is big inside. It has three smoking racks that offer ample space for ham, fish, wiener, tofu, chicken, jerky and other food you wish to smoke. Basically, the Smoker XL by Garden Plaza does its job just as well as more expensive models. So if you are a new cook and not particularly bothered about having the most feature-rich appliance, the Smoker XL by Garden Plaza will fit you to a tee. Unlike smokers from similar price segment, the Smoker XL by Garden Plaza doesn't come flat packed and includes all main components and hardware in the package. 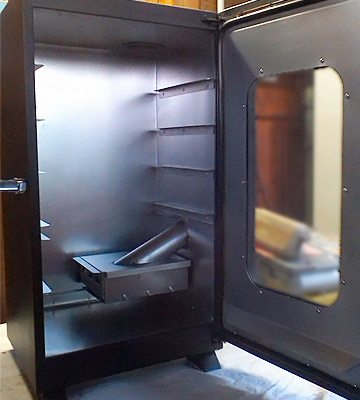 On delivery, you will only need to fit its door and handles, which should be done quickly and easily with the detailed instructions supplied with the smoker. It's worth mentioning that the Smoker XL is rather sharp on the edges, which is why it's best to assemble it on surfaces that are not prone to scratches. One other minor gripe is that the Smoker XL has no heating element, meaning you'll need to use a smoke moth to ignite it. On the bright side, the functionality of the Smoker XL by Garden Plaza can be easily expanded. For instance, if you buy a special cold smoking device, you'll be able to use it for preparing not only hot delicacies but cold ones as well. All this makes it a great value for the money. Industrial requirements, as well as customers' demands, have increased vastly in the recent years. The Royal Catering company, however, keeps up with the trends and comes up with unique, innovative solutions that set new standards for other brands. Whatever they do, the folk at Royal Catering do not skimp quality and the smoker we're going to review next shows to prove that. 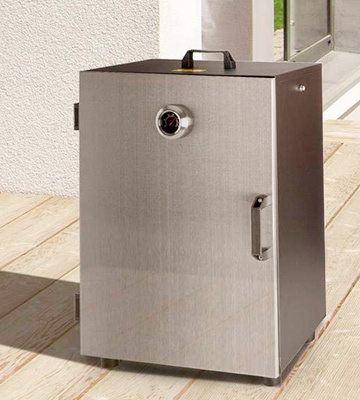 Made of stainless steel, this smoker is robust, durable, and highly resistant to high temperatures, humidity, and acids. Thanks to the anti-slip feet, this smoker is also very stable so you can use it anywhere. For convenient transportation, the manufacturer designed it with two handles. 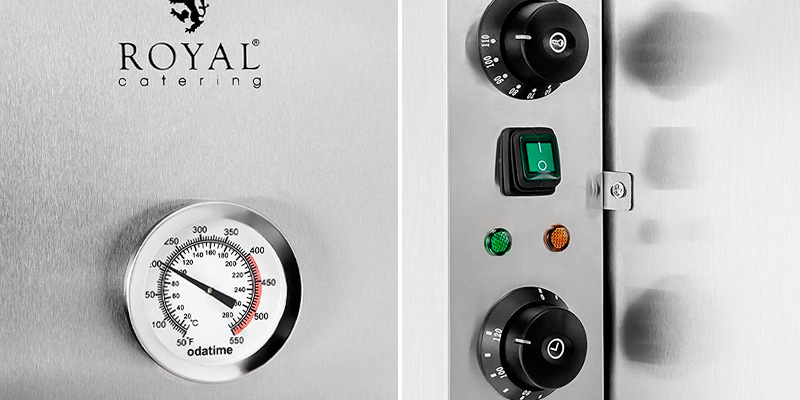 What sets the Royal Catering RCRO-870 apart from some counterparts, however, is its high power. Fitted with a 1000-Watt heating element and 70 litres of volume, it's arguably one of the most powerful electric smokers out there. 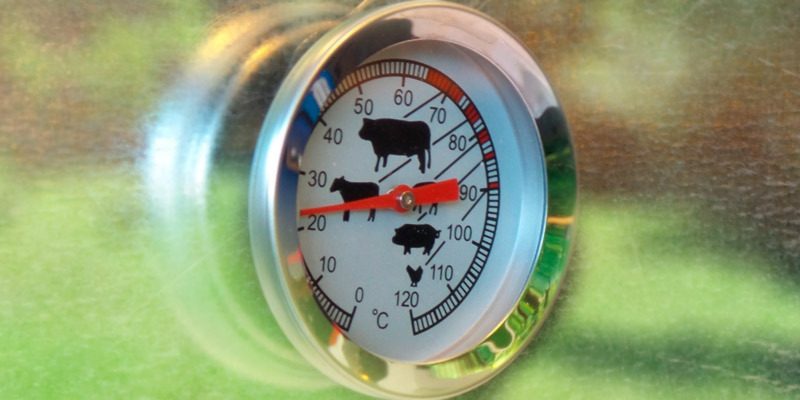 You can select heat setting in the range of 0 - 110 ° C for cold, warm or hot smoking depending on what you want to cook - meat, fish, cheese or vegetables. Plus, you can choose smoking duration with a timer that is adjustable up to 120 minutes. When cooking is over, the timer produces an alarm signal. We would like to point out that it's not only smoking time that affects the taste of food. The wood plays an important role, too. With that in mind, manufacturer highly recommends you use juniper as "fuel", which should give your smoked delicacies an outstanding taste. Summing up, if you're looking for a smoker with a robust and durable design that would serve you for many years to come, you'll be hard-pressed to find a better option than the RCRO-870 electric smoker. Designed by the company with such a promising name, this smoker stands to cater to all customers' needs. Besides the food smoker itself, the delivery package includes a chimney tube, 4 storage boxes, 10 smoking hooks, a collecting tray, a collecting plate for grease, an embers box, and a container for ash. The container for ash should be placed under the smoke box for collecting the burned ashes. 4 grates are able to accommodate plenty of food. 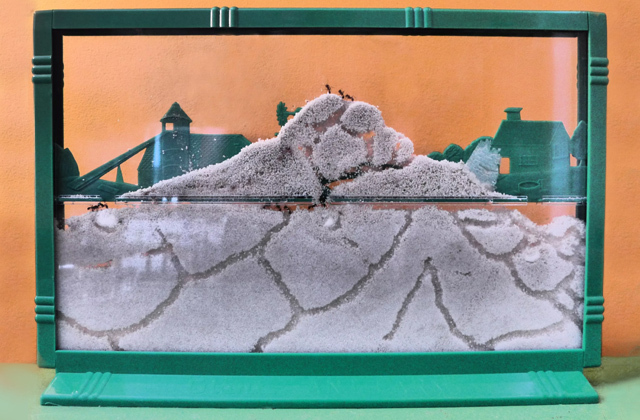 They have a minimum distance of 11 cm inside the chamber. 10 hooks allow you to hang sausage or fish, for example. The collecting tray catches grease produced during smoking. It protects the firebox and the bottom of the smoker from impurities. Whether you need a replacement for your smoker, or you want to start smoking food, the Klarstein GQM-1500-Fstone Electric Smoker will be right for you. Klarstein is a German company that earned reputation of a producer of premium-quality products. 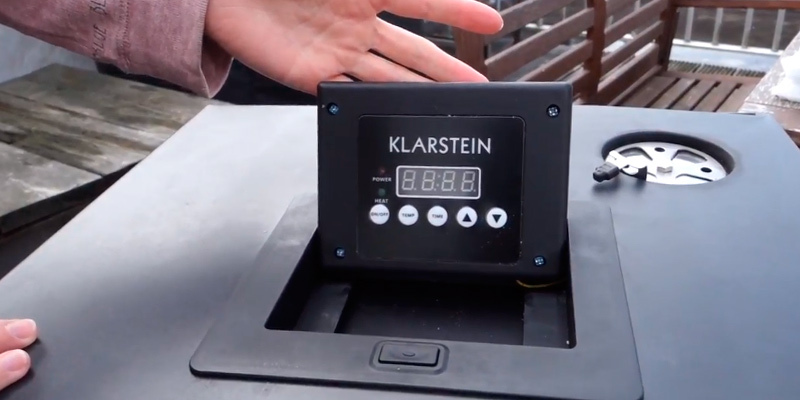 Taking a quick look at the Klarstein GQM-1500-Fstone Electric Smoker is enough of a reason to see why people trust Klarstein. The smoker is both solidly built and a great looker. Its exterior is produced from stainless steel with black powder coating, while the interior sports galvanized surfaces and accommodates 4 stainless steel racks. You can change the level of racks as you need. Inside the chamber, there's ample space for several chunks of meat, whole fish, slices of bacon, poultry, tofu blocks, and other products, which makes it a suitable choice if you often host parties, or you're a big fan of smoked food. Equipped with a 650-W heating element, the oven doesn't tail behind its counterparts in terms of performance. 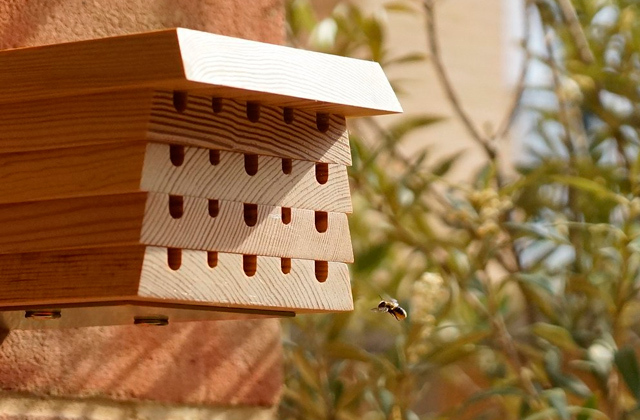 It doesn't eat through wood chips and allows them to release their flavour so that it penetrates slowly into the food. The good thing is, the smoker is compatible with wood chips by all producers so you can buy any you like best. 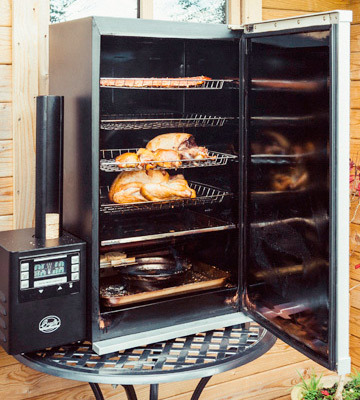 The Klarstein GQM-1500-Fstone Electric Smoker is easy to control with the fold-out panel on the top, while the cooking process is easy to observe through the viewing window. 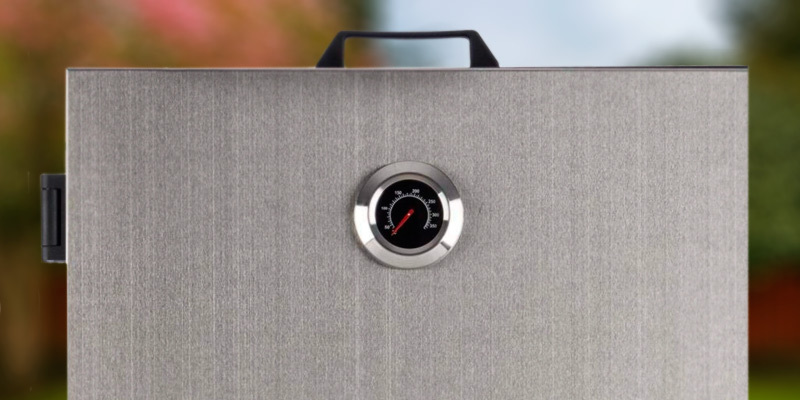 For easy cleaning, the smoker comes with a tray that catches dripping fat from the food. 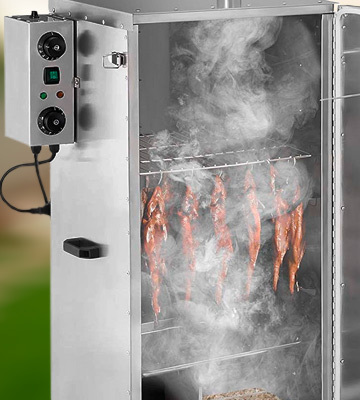 In all, the Klarstein GQM-1500-Fstone Electric Smoker is a high-quality appliance with a long shelf life that will perfectly suit big families and those who often throw parties and have guests around. That said, it might be a bit of an overkill if you live only with a spouse and smoke food only on occasions. The manufacturer kindly offers some helpful hints that can help you get the most out of this smoker. This smoker comes with a drip tray, however, note that you needn't add water into the tray unless you want to steam your food. The main function of the tray is to catch grease and fat from the food. No drip tray will catch ALL the grease and drippings, and some residue will still be collected. To make it easier to remove this grease, you can place a thin layer of special grease absorbent at the bottom of the smoker. Take note that the absorbent cannot be used forever and should be replaced after every 5-6 smoking sessions. This smoker is intended for outdoor use only. 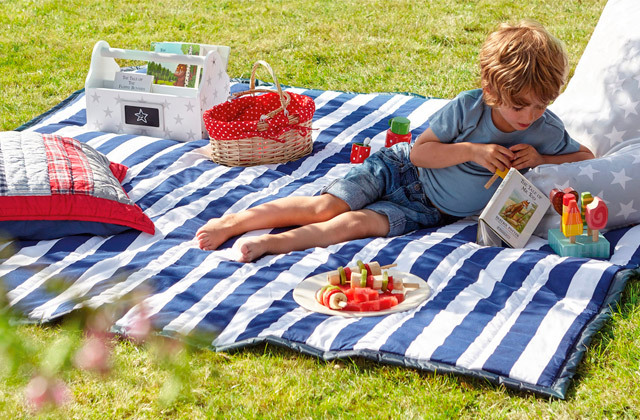 Place the unit on a stable, heat-resistant surface and make sure that there's at least 1-metre clearance around it. Do not ever use aerosols or similar products near the smoker. Since this smoker is designed for outdoor use, the outside temperature and wind conditions might greatly affect the smoking time. Bad weather conditions are likely to increase the cooking time. So, if you have an opportunity to somehow fence the smoker from the wind, do it. Also, make sure that you never keep the smoker exposed to the rain. When it comes to choosing a smoker, it's easy to get lost in an array of models available. If you ask us, of all smokers produced today, the simplest and easiest to use would certainly be an electric smoker. The advantages electric smokers offer are rather obvious. For one, they ensure excellent results; it's enough to set up an accurate smoking temperature, and the food will be done perfectly. For two, they allow you to smoke food without you having to control the process. Thanks to the timer function, they can do the job for you by the time you wish. Last but not least, they save you the need to keep it fueled. Dissimilar to propane and charcoal models, all electric smokers need is an electric socket, which makes them a suitable option for most everyone. If you've got room and don't mind setting a smoker in your backyard, we'd recommend you to pay attention to our review on charcoal smokers. 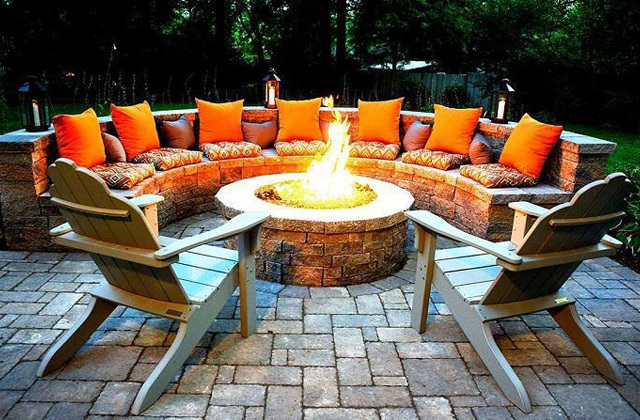 One other appliance you may find a good use for in your yard is a patio heater. Speaking of dimensions, it's necessary to take into account not only the size of the appliance itself but also a cooking surface you’d need for smoking. If you don’t plan to cook batches of smoked snacks for big get-togethers, then you’d be fine with a small to moderate-sized electric smoker. But for more intense use, a bigger capacity is a must. Consider whether the chosen smoker comes with the racks to adjust the space inside the appliance to fit in more foodstuff. This feature can add some usable space even to a small item. The control feature is also important and will tell you how easy a smoking will be. Contemplating which one to choose - a digital or analogue electric smoker, we recommend you to give preference to the former since it’s much easier in use and there’s nothing more you need to do rather than push several buttons once. 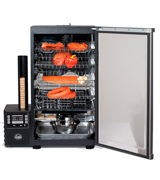 Analog electric smokers are a bit trickier in use and require your constant supervision. Consider whether the smoker you chose comes with a meat probe. It’s not a compulsory item but it can help a lot when determining the doneness degree. Speaking of the power, opt for higher numbers if you want to cook quicker. Some other things to pay attention to are a water bowl, a grease tray and a capacity of a smoke box. These features provide a fast cooking process and easy maintenance. Since electric smokers are mostly used outdoors, it’s essential that they are made of durable, rust-resistant and solid material. Besides quality material, the construction should also feature a well-insulated door (preferably windowed) and a lid to prevent a possible heat leakage. The wheels and handles would be welcomed if you’d need to change the setting of a smoker, moving it from one place to another. Pay attention to all these features and little extras and choose the most suitable electric smoker among the best presented below. Water is an essential thing for successful smoking. For example, a generous 270-kg load of meat puts out approximately 90 kgs of water during the smoking process. And to keep the inner chamber of the smoker moist, you can place a bowl of water, use soaked wood chips, spray ingredients with apple cider or wine, or mop the food with a special BBQ mop sauce. Apart from common meat, fish, sausage, you can smoke such unique ingredients as cream, butter, ricotta cheese, maple syrup, sugar, honey, salt, mayonnaise, ketchup, hot sauce, tomato sauce, mustard, olive oil, capers, olives, garlic, lemons, bologna, and even ice. And as gourmets tell, the taste is really delicious. The most popular day of grilling in America is the Independence Day. In the UK, there is no one special day, however, there is a National BBQ Week that usually takes place at the beginning of June. But if you’re a true grill-lover, you know for sure that every day of the year is good for outdoor BBQ! Smoke results the taste of your food, but not all wood chips taste the same. The most widely-used types of wood are apple, pecan, cherry, oak, guava, maple, kiawe, hickory, and mesquite. It’s considered that hardwoods produce the best flavour. The wood that contains resin or tar isn’t used for BBQ, as it gives a chemical taste. Smoking, as well as grilling, is more like a family tradition rather than a hobby. 60% of smokers say that they have learnt it from their father, uncle, brother or other older family member. People in America consume more than 900,000 kg of jerky annually. Jerky is the result of a smoke-drying process, one of the first methods our ancestors used to preserve food. Actually, smoking almost doesn’t impact the nutritional value of food. Moreover, it can be a great way to add flavour without adding fat, calories, and sodium. It’s the marinades and sauces that can add a large amount of fat, sodium, and even sugar. So it’s advisable to use them moderately. If you use hot smoking, keep in mind that the heat can destroy some vitamins in vegetables, but it can also boost the production of the antioxidants and kill the bad bacteria. A rule of thumb, it’s better to keep smoking time and temperature to the minimum. 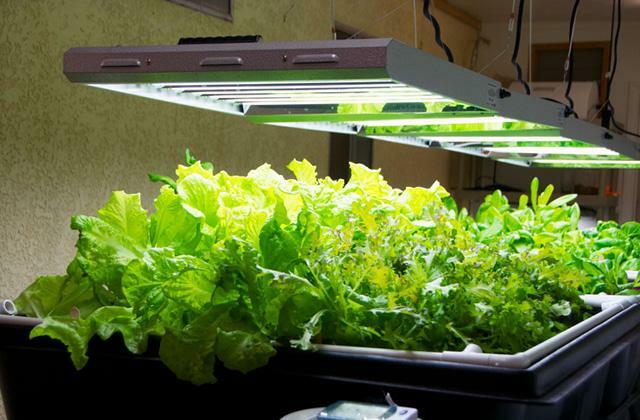 This way, you’ll get more nutrients. Q: What is seasoning? How is this procedure carried out? A: Seasoning of an electric smoker is a procedure which should be carried out before the first use of your appliance in order to get rid of the unpleasant smell that almost any new appliance has. In general, to season your new electric smoker, you need to make it work empty for approximately an hour at 150°F. Yet, since the operating principle of electric smokers might differ, it is recommended that you read a user's guide to learn how to carry out the procedure properly. The food smoked in the appliance which is regularly seasoned is much richer in flavours and tastes much better. Q: Can I use an electric smoker indoors? A: Electric smokers, as well as charcoal and gas-powered ones, are intended for outdoor use only. The main reason for this is that they produce smoke. Even if your kitchen is well-ventilated, you will not be able to avoid that heavy fog of smoke that trails the smoking process and remains in the air for several hours. The only case when the use of an electric smoker in the premise is allowed is when it's designed for commercial purposes and you're buying it to set in a spacious place. Q: Do electric smokers come with bisquettes/chips and accessories like a meat probe? A: It depends on the manufacturer and you can find different offers on the market. However, more often than not, you’ll have to buy accessories and wooden bisquettes/chips separately. 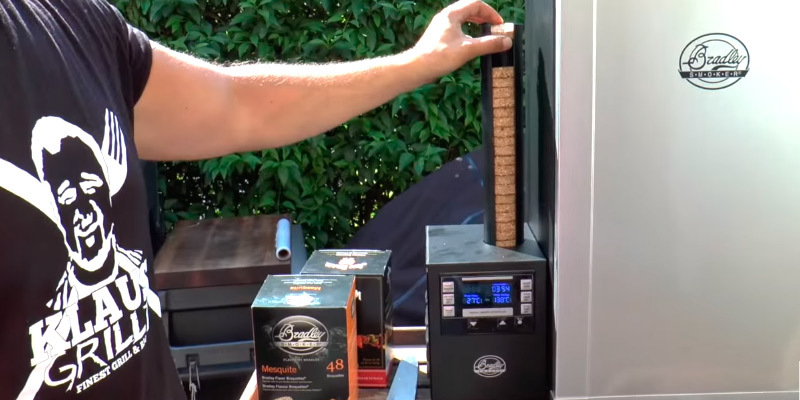 On the one hand, it can be inconvenient since you won’t be able to use your smoker right out of the box if you don’t have all the necessary things at hand. On the other hand, if you buy additional stuff yourself, you can choose wood chips the flavour of which you like better, or, if you buy a meat probe, choose the one a bigger number of different functions. Q: Do I need to control the smoking process all the time or is it enough to set the temperature and the time and leave until the food is ready? A: Though we all would like the smoking process to be simple and effortless, it's not quite the case, alas. You will still need to control the cooking process and manually add chips or bisquettes when a loaded batch burns out. Q: Can I use an electric smoker during cold seasons? Don’t open the smoker door too often. Since electric smokers are made of metal, they do not retain hot temperatures very well when the weather is cold. If you open the smoker door - you let the hot air out. Create a shelter for your smoker. The smoking results will be much better if you place the smoker under some kind of a roof or surround it with something like a wall to keep it away from wind, rain, and snow. Insulate the smoker with flame-resistant material to keep the heat inside the smoker. 1. Meathead Goldwyn Electric Smokers: Buying Guide, Reviews, Ratings, And Recommendations, AmazingRibs. July 10, 2013. 2. Justin Brunner Meat Smoker Wars: Which is Best? FARM & FLEET. May 18, 2015. 3. Derrick Riches How to Buy a Smoker, About. February 12, 2016. 4. Meat Smokers Buying Guide, eBay. December 21, 2013. 5. Kristen Hicks BUYER’S GUIDE: Grills & Smokers, Compact Appliance. June 26, 2015. 6. Choosing the Best Electric Smoker for You in 2015, Medium. March 19, 2014. 7. Smoking (Cooking), Wikipedia. September 1, 2017. 8. How to Use an Electric Smoker, wikiHow.